Following a meeting of American business executives and Putin at Konstantinovsky Palace near St. Petersburg on Saturday, Kraft showed the ring to Putin — who tried it on, put it in his pocket and left, according to Russian news reports. Stacey James, a spokesman for the football team, said Wednesday that Kraft was traveling and he hadn't talked to him in four or five days, despite e-mails and calls. "He's still overseas, I can't even tell you where. ... He's not due back until next week." "It's an incredible story. I just haven't been able to talk to Robert Kraft to confirm the story," James told The Associated Press. However, a Kremlin official who spoke on condition of anonymity out of fear of compromising his position told the AP the ring was a present. "Such a present was made," the official said. 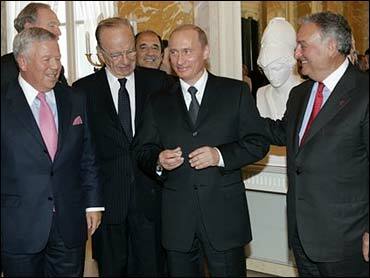 He said Putin had given the ring to the Kremlin library where other foreign gifts are kept. James said the ring's worth was "substantially more" than $15,000, as the value had been reported. He refused to be specific, but noted that the ring has 124 diamonds. Kraft handed out Super Bowl rings to players and coaches at his home two weeks ago. The Patriots have won three of the last four Super Bowls.